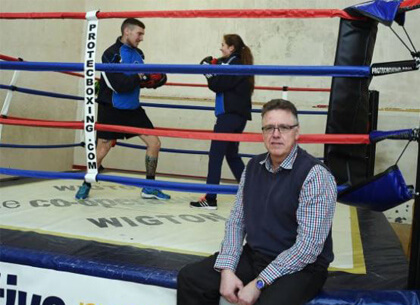 Wigton Boxing Club is appealing for volunteers to help secure its future. The club, which has been praised for its work with young people in the local community, had faced financial difficulties but plans are now being put in place to ensure it remains viable and a vital asset to the town. Last year Paul Radcliffe, who had been in charge of handling the club’s finances, took a step back due to family issues and the club later found it did not have enough money to pay its rent. Dedicated volunteers led a community collection which raised £400, allowing the club, which was set up in 2009, to pay its rent for March. Mr Radcliffe is getting involved again to help ensure that a similar situation does not arise in the future. But he is hoping others in the town with a business background will come forward to share their expertise. “The way we always wanted to run the club was that we had the right people in the right positions,” Mr Radcliffe told The Cumberland News. For example Andi Crossman, who is a coach and was involved in setting up the club, sticks with the coaching. My background has been in sales and management, so I was sticking solely to the financial side of things. Unfortunately I had to step back. A while ago, I did a favour for Andi and in passing asked how the finances were. He told me he hadn’t looked. I said that he should and it was then that he realised there was very little in the bank. I decided to get involved again and I’ve been busy drawing up a business plan for how the club can progress over the next three to six months. Mr Radcliffe thanked the landlords of the premises used by the club on Water Street for their patience and understanding. They were very good to us and were prepared to give us time,” he said. “They understand the work that we’ve been doing with young people". The club was set up after the town became one of the first in the UK to use the teenage curfew powers which were outlined in the Anti-Social Behaviour Act of 2003. Since then it has continued to go from strength-to-strength, which is why Mr Radcliffe is keen to ensure it survives in the long-term. He continued: “We’ve had a lot of support from the likes of the neighbourhood forum, Wigton town council and Allerdale council. When we moved to our current location, Fred Story actually stepped in to provide materials that meant the building was up to scratch and could be used. However, he is now hoping that other people in the town will come forward to help the club. Mr Crossman echoed Mr Radcliffe, saying he believes the club has become a vital community asset. He is also hoping that people in and around Wigton will show their support. If you can help, contact the boxing club on 07834 371872.